A few months back I discussed the Kir Royale as a great New Year’s cocktail. And while it definitely is that, I think it’s a great candidate for a brunch tipple as well. 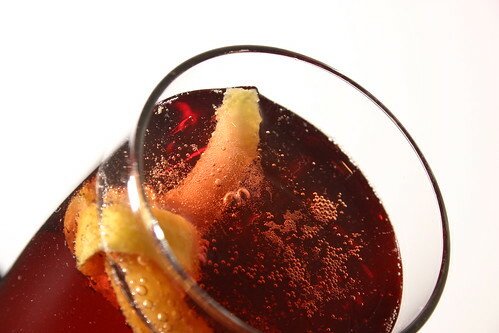 The classic Kir Royale is a combo of 1/2 oz of creme de cassis and 5 oz of champagne. While it’s a simple mix the flavors are fresh, bright and lightly complex. But, let’s take a slightly deeper look at this combo. It really breaks down to champagne with a fruit liqueur. Well, there are lots of fruit liqueurs (and some non-fruit ones too) that you could sub in this that will change up the flavor profile completely. Here are some suggestions to get you rolling. I could continue on, but I think you get the idea. I sampled the St. Germaine option and really enjoyed it. It’s a definitely departure from the classic Kir Royale, but it’s very tasty in its own way. The flowery flavor comes through gently and in harmony with the flavors of the sparkling wine. Definitely worth a sample. So there you have it, a simple cocktail with an easy twist. I’m not going to lie to you; the Bloody Mary is not one of my all time favorite cocktails. In fact, I don’t really like them much at all. However, I’m now going to flip flop a bit and say that while I don’t generally like them they do go quite well with a savory brunch. Picture a well prepared omelet, perhaps some home fries or a good hash, some good bread toasted. What do you pair with such a fine repast? A Bloody Mary. It ties together the whole savory vibe. You could even tweak the standard recipe by adding a flavor from your omelet to really pull it all together. So, now that I have your mind moving in the right direction here’s my preferred Bloody recipe and the link back to my previous post if you’d like to read my full thoughts. Enjoy! Guess what time it is? Did you guess “Thought Experiment Time”? No? Well, it is. So, here’s the experiment; we’re going with word association this time. What’s the first thing that comes to mind when you hear the words “Mother’s Day”? Did you say brunch? If not, pretend you did, just to make me happy. 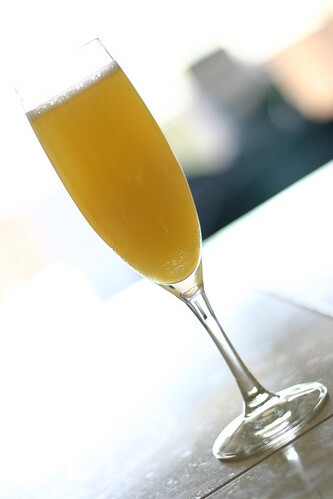 Okay, now that we’re in the moms and brunch mood let’s talk cocktails. Cocktails are a solid brunch choice. But, what do you choose? There are some easy answers like the Mimosa and the Bloody Mary. Some of these classics I’ve already discussed, some I have not. So, here’s my plan for the week. I’m going to quickly cover two new cocktails and I’m going to review two cocktails that I’ve already touched on. This should give you some solid brunch footing, be it for Mother’s Day or otherwise. With that, let’s get brunching. An apple a day keeps the doctor away. Or so the saying goes. So what does the distilled essence of a bushel-load of apples get you? A damn fine cocktail and, near as I can discern, immortality. 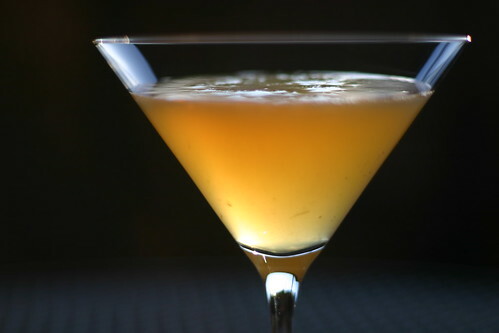 The Honeymoon Cocktail is another drink where the fresh apple flavor of the calvados really makes the drink pop. To make sure it really was the fruitiness of the calvados at work I mixed up a version using applejack instead. And while it was still a good drink to be sure, it wasn’t nearly as interesting. The apple flavor of the calvados is much stronger and much brighter than what you find in applejack and really makes the flavor profile of this drink much more complex. I really can’t make any major suggestions this week for changing up the recipe. In fact, I only have one. The version from Vintage Cocktails and Forgotten Spirits was a bit off balance toward the sweet end of the spectrum. The fix was uber simple though. I bumped the lemon juice up to 3/4 oz and all was right with the world again. So, while I can’t suggest huge changes to the recipe, I can add a couple quick comments about the other ingredients. First, to get it out of the way, I’m going to remind you to always use fresh lemon juice. I know you don’t need the reminder, but it never hurts to refresh the fundamentals. Second, the Benedictine. Like ingredients in so many other cocktails you’re not going to be able to pick it out if you didn’t know it was there. But, and it’s a big but, you will definitely notice it if it’s gone. Third, and last, the curacao. If you don’t have curacao I’m going to give you permission to use a triple sec instead. Sure, you’re going to lose a bit of the flavor of the brandy base, but at 1/2 oz it’s really not going to be a huge loss. Not to mention you’re using tasty calvados which is also oak aged. So, like brandy, you’ll get those woody notes coming through as well. So, there you have it. Now it’s time for a quick summary to send you on your way. The Honeymoon Cocktail is the second in a recent batch of seriously delicious calvados cocktails. If you don’t have a bottle in your liquor cabinet I think it’s time you change that. You can thank me later. Note: Your immortality results may vary. If at first you don’t feel them, have another drink.